Chinese president Hu Jiantao is in Cambodia on an official state visit, coinciding with a major Asean regional meeting that began Friday in Phnom Penh. Hu’s visit, the first from a Chinese head of state in 12 years, comes as Phnom Penh is hosting five days of meetings with top regional ministers, with Asean leaders to meet here next week. Cambodian villagers were prevented from submitting a petition to the Chinese Embassy on Friday asking Hu’s help in curbing the tourism development of approximately 30,000 hectares in the coastal province of Koh Kong by a Chinese company. The development underscores China’s increased economic involvement in Cambodia, this year’s head of Asean, at a time when regional partners are at odds with their northern neighbor over the South China Sea. China invested some $1.1 billion here in 2011, with Cambodian imports of Chinese goods reaching $2.3 billion, according to government figures. 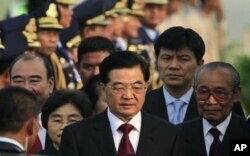 Chinese President Hu Jiantao, center, arrives at Phnom Penh International Airport, Phnom Penh, Cambodia, Friday, March 30, 2012. Hu on Friday arrived Phnom Penh on his four-day state visit to Cambodia. Hu will meet with Prime Minister Hun Sen and other top officials. China Radio International said that Hu is expected to sign agreements on technology and the economy, but a Cambodian Foreign Ministry spokesman declined to elaborate. Critics meanwhile see Cambodia’s strong ties with China, a major donor country and investor, as an impediment to the goals of other Asean sates, especially those embroiled in disputes over maritime boundaries and islands in the South China Sea. Opposition lawmaker Yim Sovann, meanwhile, said Hu’s visit was an occasion to examine development projects like that in Koh Kong to determine whether they violate people’s rights. Chan Saveth, chief monitor for the rights group Adhoc, said about 40 villagers who had sought to petition the Chinese for intervention in the Koh Kong dispute were sent back to their home province by police.